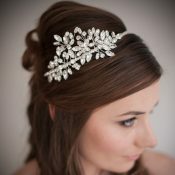 Sometimes a little bit of sparkle just isn’t enough, and you want to make a real statement with your bridal headband. Here at Chez Bec we understand that everyone has a different idea of how they want to look on their wedding day, and sometimes, sometimes, full on 1920s glamour is all that will do. Our Sophie Deco Bridal Headband was one of the pieces inspired by a trawl through the Cartier archives. 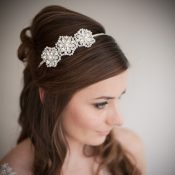 The Sophie Deco Bridal headband is very light to wear, and really versatile. It can be worn lower down on the head (as shown on our beautiful model). 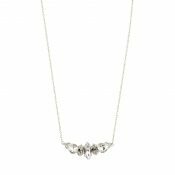 Worn this way, the trailing lengths of diamante cascade to frame the face. 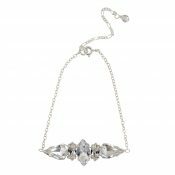 Alternatively it can be worn higher on the head, more like a headband, with the diamante chain either flowing loosely in the hair, or, with the help of a handy bobby pin or two, the chain can be pinned back framing an up-do. 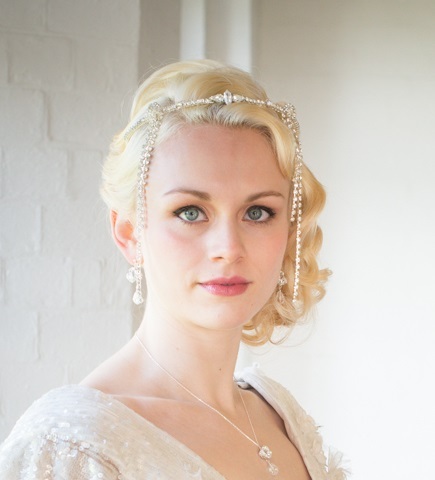 The Sophie Deco Bridal Headband is an inspired vintage design. 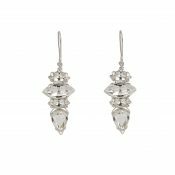 Simple in its composition, easy to wear, but visually stunning. Be the first to review “Sophie Deco Bridal Headband” Click here to cancel reply.